Today I was driving down the steep southern side of Coryland Hill on my way to Troy when I straddled a very large cow chip that looked sort of like a turtle. Or was it? I down shifted, hit the brakes, made a turn in someone's driveway, came back up the hill, parked in the middle of the road, put my flashers on and stepped out to investigate. Lo & behold, the cow chip that looked sort of like a turtle turned out to be a turtle that looked sort of like a cow chip. 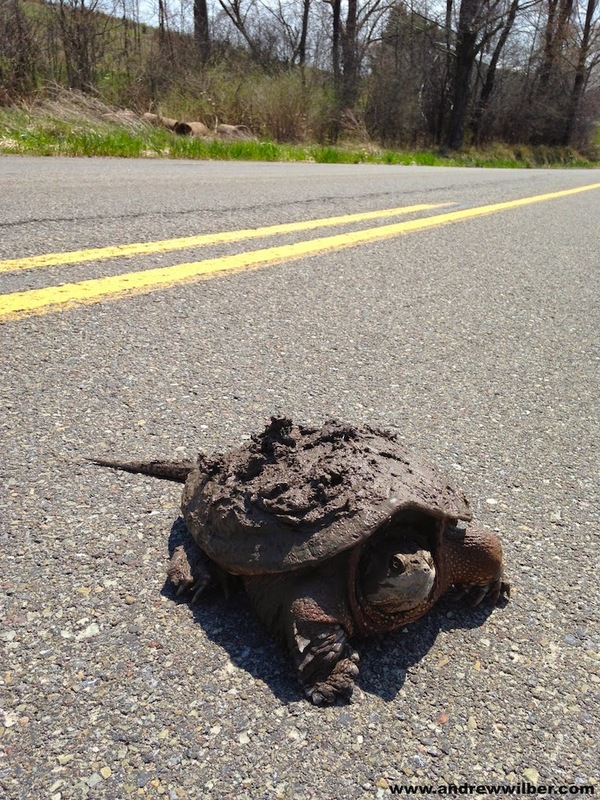 This relatively large snapping turtle had somehow got a load of mud on its shell, and then set out to cross the road at a distinctly turtle-like pace. A somewhat inauspicious combination of circumstances by any estimation. Things got worse for everyone when I saw another car coming––and realized that I'd parked my car in the lane adjacent to the animal, meaning that the entire road was now blocked. Searching around for some kind of lever with which to move the intrepid creature, I came up empty, and when the car crested the next ridge, I panicked and tried to nudge the imperturbable reptile off the road with my foot. This, was a terrible idea. What's more, I knew it was a terrible idea, and was not the least bit surprised when the lumbering animal who could not be hurried beyond 1/16mph suddenly lunged with the reflexes of Bruce Lee and buckled its giant blade-like jaws onto my toes. I just happened to be wearing steel-toed boots, so everything was fine, really. It was just one of those Frodo-gets-stabbed-by-cave-troll moments. More good fortune followed when the car that had been hurdling toward us came to a complete stop 100 feet back. I believe it crested the hill just in time for the young woman driving to see me locked––quite literally for a moment––in mortal combat with the prehistoric beast in the middle of the road. She did not proceed until I waved for her to come on by, at which point she did so very slowly, and I wasn't quite sure whether to read the expression on her face as one of admiration or mockery. At any rate, disaster was averted, and I went off into woods to search for something less valuable than my leg to move Mr. Grumpy-Pants with. I emerged with a log just in time to see a box truck swerve into the turtle's lane––and it appeared once again that all might be lost. It missed our friend by about a foot, though, and the angels in heaven cheered. 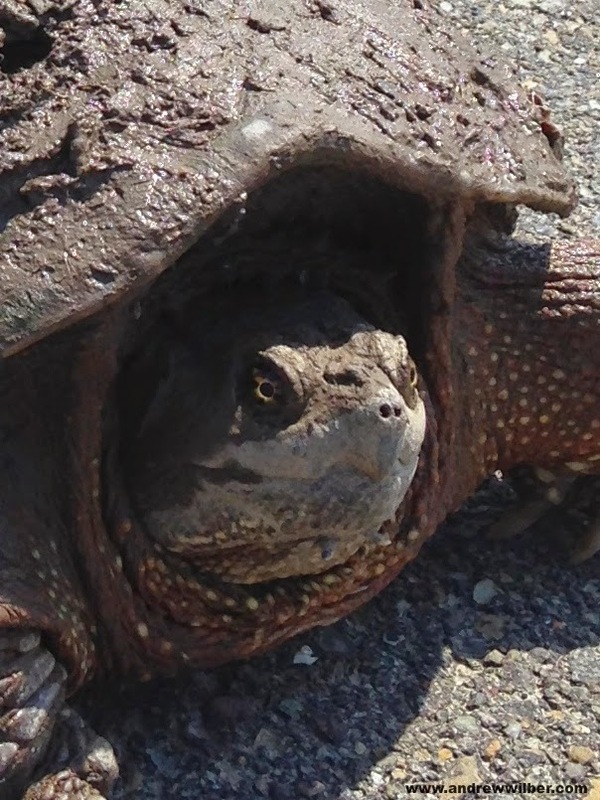 In case you ever someday find yourself in the situation needing to slide an angry snapping turtle across pavement with a stick, you should know that it is somewhere between landing a 747 with no landing gear, and playing a game of ice-hockey in which the puck is trying very hard to kill you. I eventually mastered the sport, though, and left the unhappy creature in the ditch with the log between it and the road. Later that afternoon I drove home the same way and observed both that the turtle was not where I'd left it, and that there were no signs of roadkill about. So I can only presume it lives to snap another day.